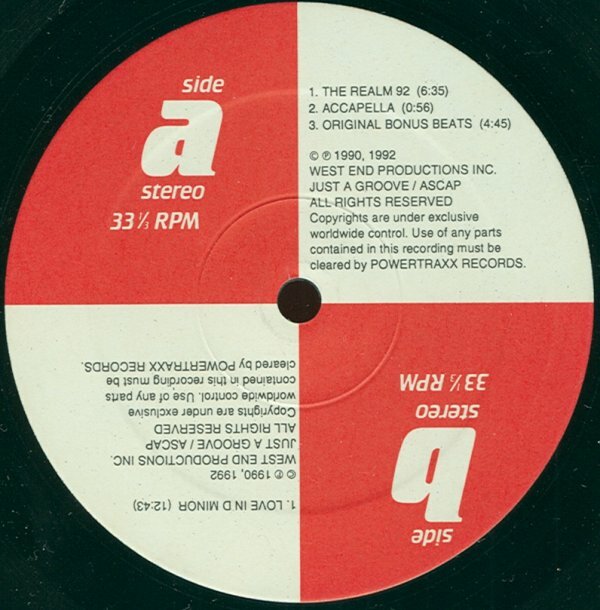 within a constant groove: Variations on "The Realm"
Who doesn’t know the acapella beginning with “Something for your mind, your body and your soul...” Speedy J made a massive hit out of a vox loop and some noisy bass, but really, was it any good? Me thinks it was just stupid loop techno. 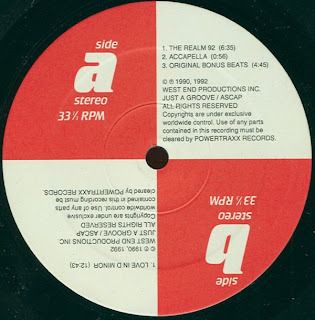 Anyway, C’hantal’s original “The Realm (Love In D Minor Mix)” is a fine example of that early 90s style of house fused with techno that New York labels like Nu Groove and Strictly Rhythm did so well. Over 12 minutes long and trippy without being psychedelic. It makes good use of hypnautic organs, breakbeats and a stunning saw-shaped bass line that C’hantal pinched from a track called "Time" by German producers Beat In Time. 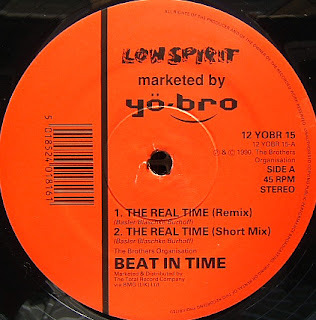 The Germans got equal when they released ‘The Real Time’, a remix of sorts of their original track that C’hantal took the bassline from, only this time using the C'hantal acapella on top to full effect, taking The Realm from grinding house to rocking euro rave. (By the way, the Short Mix is the pick here – it’s more concise – and the audio of the longer Remix is a bit scratchy in parts.) C’hantal’s 92 remix also moved toward a European techno feel, but nowhere as successfully as the natives. For another take on the bassline minus the acapella, check Peyote’s “Wardance (Warrior Mix)”. This is actually Dance 2 Trance and it’s a solid slice of their early trance techno. Nice1, thanks & how about other 2 tracks?